Boston Globe Magazine cooking columnist Adam Ried is also the kitchen equipment specialist on the PBS shows “America’s Test Kitchen” and “Cook’s Country from America’s Test Kitchen” and the author of Thoroughly Modern Milkshakes. A year in Paris can rid an American of many an uncivilized habit. But as Adam Ried explains, a dependency on Cheez Doodles isn’t one of them. 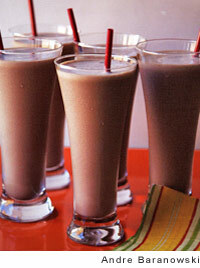 Milkshakes, a passion of Adam Ried, proved troublesome to find and make after moving to Paris. It took a flaming adaptor for him to finally succeed. Chocolate, cinnamon, and chipotle peppers–dried, smoked jalapenos–give this milkshake a distinctive kick and a bit of heat. Great for burgers, hot dogs. Coolness personified. 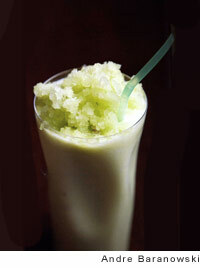 A creamy vanilla-honeydew shake is topped with an icy cucumber-lime granita. A must-make recipe for summer entertaining. 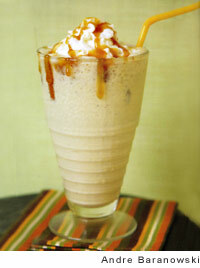 For this milkshake recipe, caramel ice cream is blended with malted milk powder for a mellow, sweet treat everyone will love. Especially the kids.